When applicants you've sourced land in idibu, there are three different options available for forwarding their details to your CRM and vacancy. The method you choose is completely based on the best workflow for your business, and how you want idibu and your CRM to work together. In this article we're going to talk about the benefits of each and explain how they work in practice. We'll also explain how you can forward those candidates you'd like to 'keep on file' into your CRM. At the end we'll provide a link to another article which explains how you set up your preferences. This is the most straight forward option in many ways as it requires no action on behalf of the user. Every applicant that lands in idibu is automatically forwarded into your CRM. You can still have our autoresponder message set up that acknowledges the receipt of the application, but it does mean that the other responder messages (accept, keep on file, reject) cannot be used. If your objective is that every single candidate is captured in your CRM, regardless of experience or sifting, then this is probably the best option for you. This option allows you to review the applications inside idibu and process them using our traffic light system. The key point is that one click of the green traffic light button means your candidate details are forwarded directly into your CRM and vacancy. 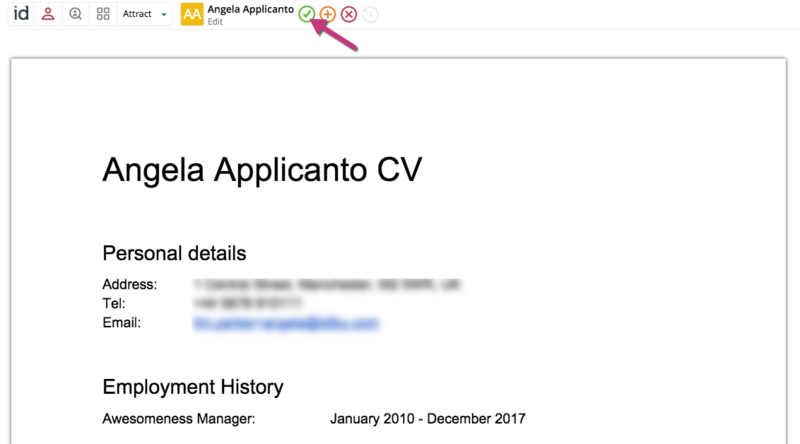 It also means that you can still reject and delete unsuitable applicants using the red button, keep candidates with potential for other opportunities on file using the Amber button - all from inside idibu. You can also use our autoresponder suite to completely automate the applicant communication at this stage. If you want to maintain a level of control over which candidates are forwarded into your CRM, but you don't wish to do any prescreening outside of the CRM, then this is probably the best option for you. You can quickly sift through the applications using our CV preview and then progress suitable candidates with one click. Used in conjunction with our applicant autoresponders, you can simultaneously trigger a bespoke email to the candidate letting them know they are moving forwards in the process. 2. From inside the candidate list. Simply click the green button and the candidate will be forwarded into your CRM. NB: Inside idibu the candidate is assigned the default status of 'New' for that vacancy. The third and final option is to allocate an ATS status as the trigger for forwarding your candidate. This can be one of the default statuses we provide or a bespoke status of your choosing. All are very easy to set up and allocate. If you want to keep the data in your CRM super tight then this might be the best option for you. 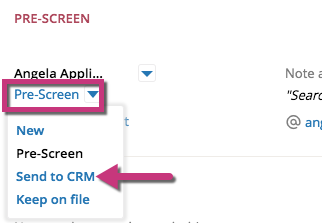 It allows you not only to sift your applications inside idibu, but also design a bespoke pre-screening process before forwarding a candidate into your CRM. When we say a pre-screening process, most clients using this are still only taking their candidates through a very small process in idibu. The main candidate processing still very much happens inside the CRM. But the benefit afforded here is the candidate's likely suitability and commitment can be tested before progressing them into the CRM. It also means our engagement suite can also be used to continue the automated communication through these stages. 1. Click the green traffic light button when either inside the candidate list or the candidate record. 2. The ATS status list will appear and you simply select the next status you wish to allocate them to in the process. NB - the above image is just an example. Remember you can configure the idibu ATS list however you wish. 4. At the appropriate stage in the process you simply click the existing status under their name. When the drop down appears, click on your trigger status and their details are forwarded into your CRM. Depending on the CRM, we will also forward any notes and emails logged against their record up to this point. Forwarding your applicants into your CRM, but NOT against your vacancy. Earlier in this article we talked about our Amber traffic light button that can be used to keep applicants 'on file'. Inside idibu this means an appropriate autoresponder message will be sent to the applicant ( which you can make bespoke) and their details will be stored for future use. However, we also appreciate you might want to forward all of these candidates into your CRM at the same time to retain them in your talent bank. Therefore, we've created the option to automatically forward these candidates when the Amber button is pressed. This means they will be sent to the CRM, but they won't be logged against the CRM vacancy. NB: Inside idibu, the candidate is assigned the default status of 'Keep on file' for that vacancy. If you are the account administrator and want to update how you are forwarding your applicants into your CRM, take a look at this article explaining how to update your settings.